I reviewed an old Classics Illustrated last week, and Eureka's Graphic Classics line follows the same basic idea of adapting older works into a comic format. The idea is again to entice readers to pick up the originals based on what they enjoyed in the comic version. Eureka, though, has a slightly different model than Classics Illustrated by A) doing full-on graphic novels with 140-ish pages and B) getting some name talent like Roger Langridge, Rick Geary and Richard Corben to work on their books. Their latest volume, African-American Classics, includes works by Kyle Baker, Christopher Priest and Trevor von Eeden. 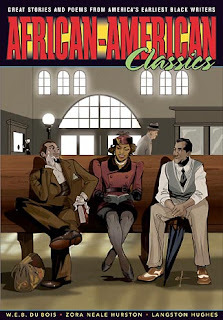 The book adapts over twenty short stories and poems "by America's earliest black authors" like Langston Hughes, Paul Laurence Dunbar and W.E.B. Du Bois. The amount of adaptation varies from piece to piece; the poems are largely just presented in their original form with an accompanying illustration while the short stories are formatted to a more typical comic narrative. Before reading, I was vaguely aware of about half of the original authors, but the only piece I was at all familiar with was Dunbar's Sympathy, known for the "I know why the caged bird sings" line that inspired Maya Angelou's book of that title. So I can't really comment (yet) on how well or poorly the adaptations did at capturing the originals. That said, I thought all the contributors did good jobs overall. The artistic styles seem to match well with the intent and themes of the various stories, and definitely helped smooth some of the instances where 100-year-old phonetically-written slang didn't immediately make sense to me. I was more partial to the longer stories in the collection, I suspect, primarily because I'm not a big fan of poetry in the first place. Though the art accompanying the poems was excellent. Most of the source material here was written in the first two decades of the 20th century. So it shouldn't be surprising that several of the works address inequality between races. This was still a time, recall, when some of the older people could still remember slavery and had experienced it first-hand. But they don't all try to address the topic; the last several stories in fact don't look at it at all, and the couple before that only touch on the subject obliquely. So, speaking as a white guy who never had to personally deal with racism or bigotry growing up, the book as a whole didn't come across as preachy or evangelistic. I think this is a really good book for people to look at. I know my formal education largely went from the Civil War and Reconstruction pretty directly to World War I, and then skipped over to the Great Depression and World War II pretty quickly. I suspect a lot of American school kids got (are still getting?) a similar education, and know very little about American culture and society in the early 1900s. That these stories come from an area of American culture that's acknowledged even less is a bonus. I don't pretend to really understand what it means to be black in America. I never will. Nor will anybody who isn't black and living in America. But works like these do help to make me appreciate, at least at some level, what it might be like. And that kind of understanding, I think, makes for a better planet.